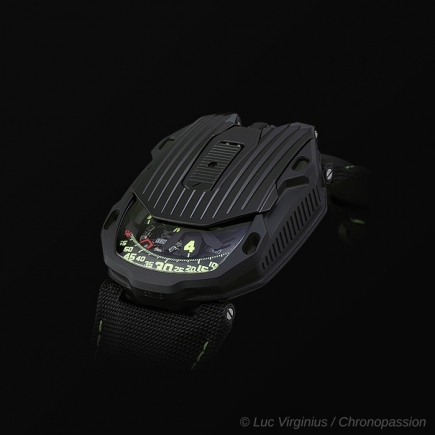 urwerk | 71'900 € Tax inc. 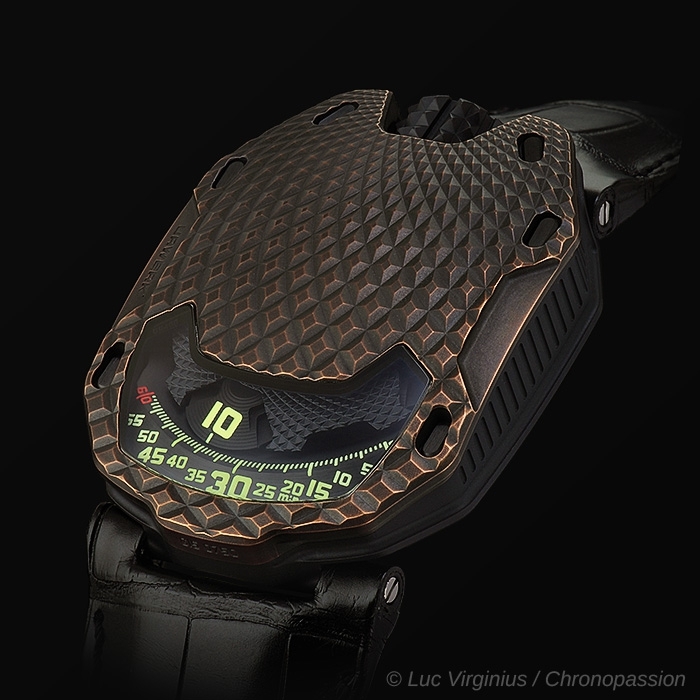 The UR-105 T-Rex is a measuring instrument that has made its way through time and space. 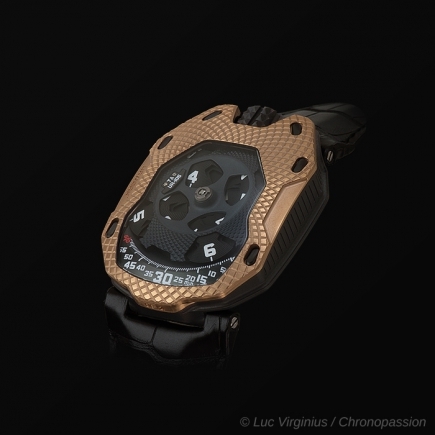 It reproduces on the wrist the most symbolic, universal and beautiful manifestation of the passing hours: the path of the sun from its rising to its setting. 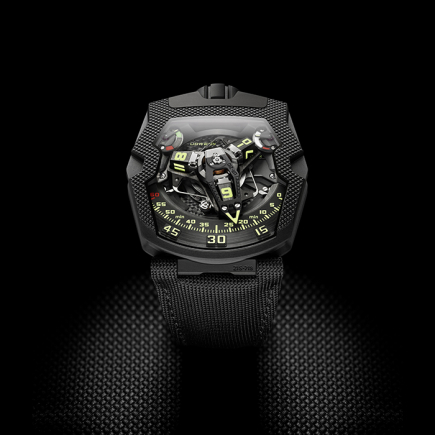 On the UR-105 T-Rex, a single hours pointer thus travels from east to west, creating an authentically universal yet minimalist depiction of time. 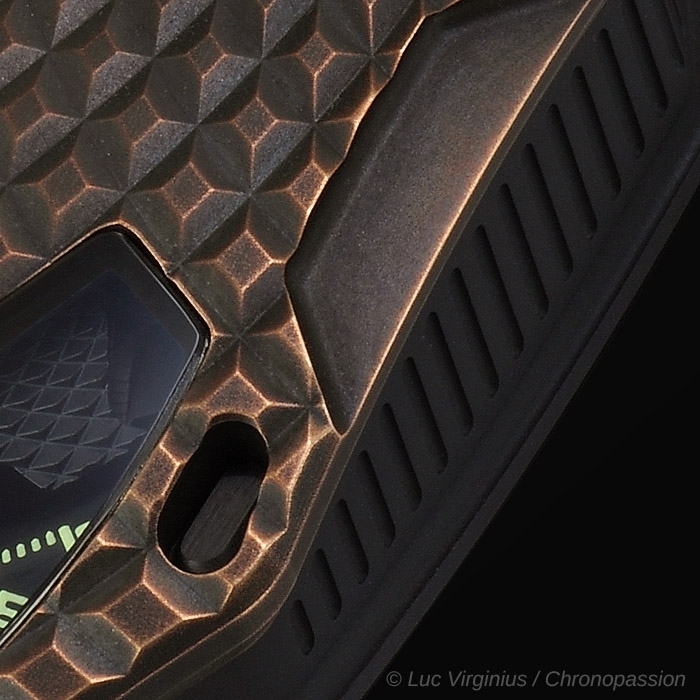 Housed in a textured pebble-shaped case, the satellite hours of the UR-105 T-Rex wander along their stage-center 60-minute journey, protected only by a bronze suit of armor. 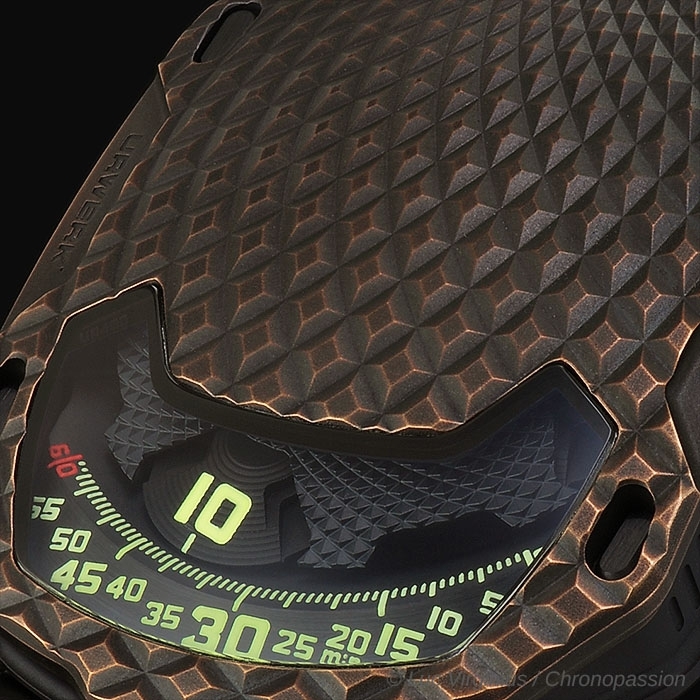 URWERK presents its UR-105 T-Rex, nicknamed after its atypical case that is crisscrossed by a raised, concentrically ribbed pattern evoking the scales of certain reptiles – a textured, bark-like coating that is soft to the touch. 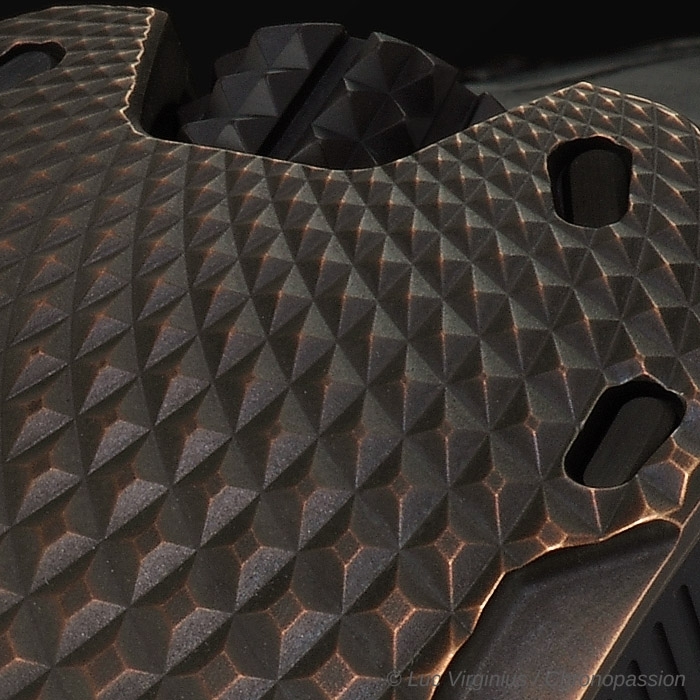 The colors of this breastplate will subtly evolve over the years. 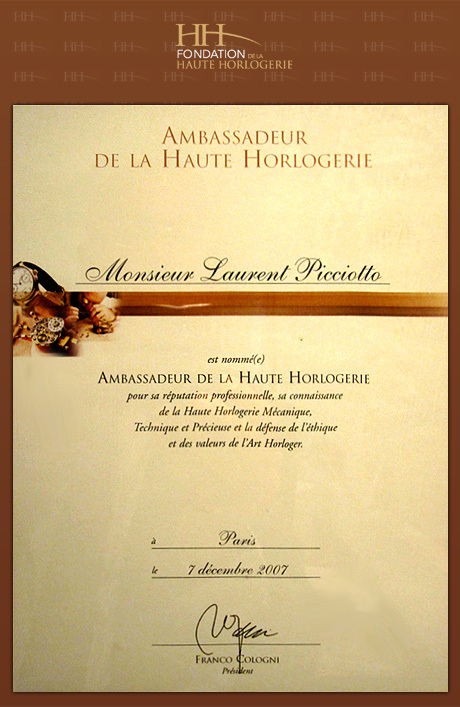 “We performed a number of different trials before confirming the exact shape of our bronze case. We wanted to achieve the perfect patina. 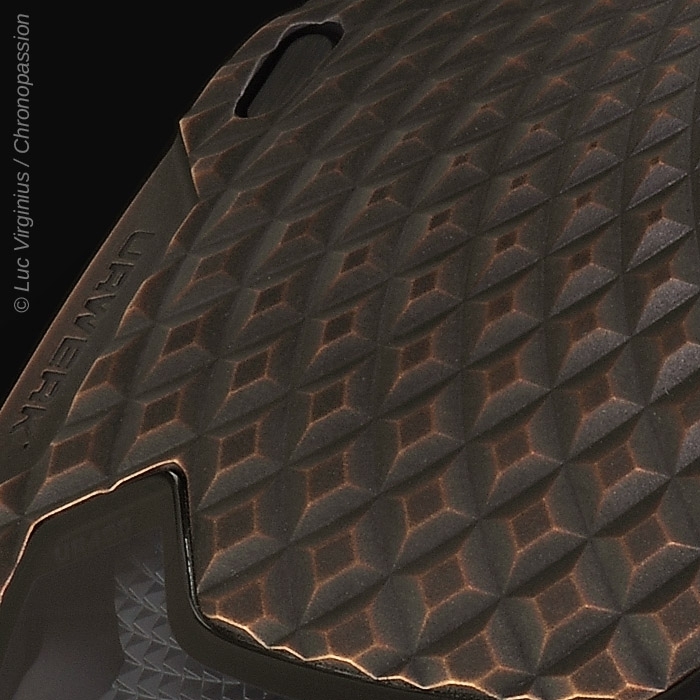 Each model is treated as one-of-a-kind. 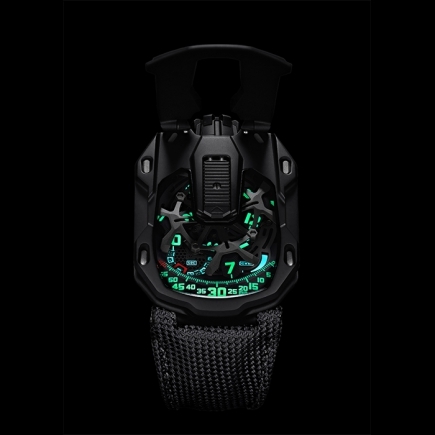 It is decorated, beadblasted, micro-sandblasted, purified and then oxidized with a brush”, explains Felix Baumgartner, master-watchmaker and co-founder of URWERK. 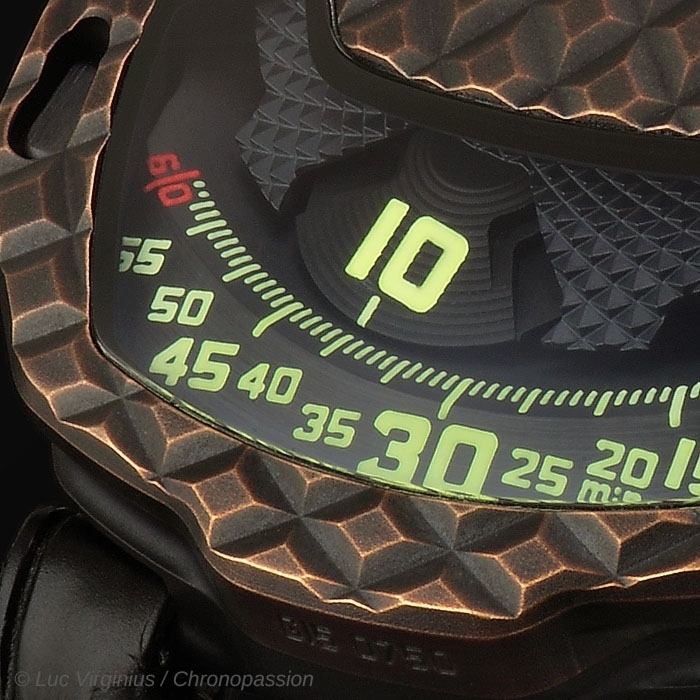 Technically speaking, the UR-105 T-Rex is a satellite hours watch such as only URWERK makes them. Four satellites, each bearing three hour numerals, successively parade past the minute rail. This original and intuitive reading of time is facilitated by a cover made of PEEK (polyetheretherketone) that conceals the satellites not relevant to the time read-off. 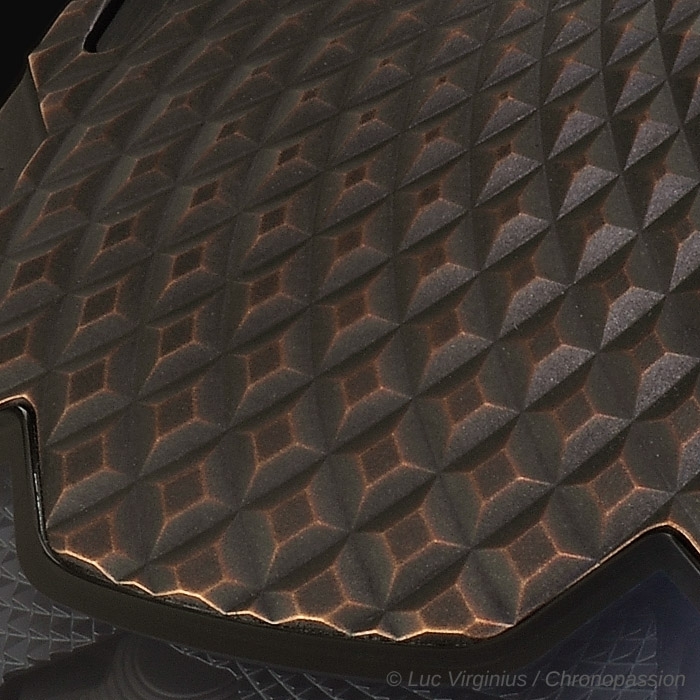 In keeping with the finest watchmaking traditions, this cover is adorned with a superb guilloché pattern. 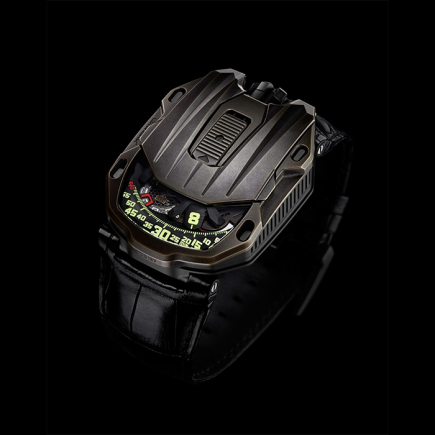 This 105 model also embodies the year of research invested into URWERK’s years wandering hour satellites. 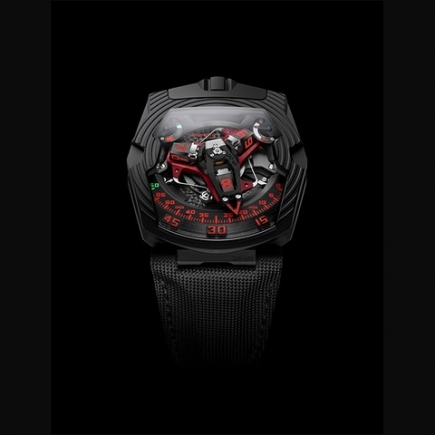 The ingenuity of the mechanism lies in the invisible carousel fitted beneath the satellite structure, and responsible for the silent and smooth operation of the satellite hours. “In our previous models, our satellites were fitted on a Maltese cross and supported by an orbital cross at the top. We rethought this concept and made some refinements. The fruits of this can now be felt when setting the time. There is virtually no friction, no jerking, just the ballet of the satellites. 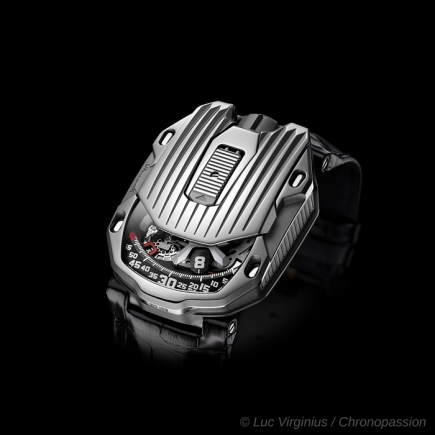 It is the fluidity of the gears that quietly reveals our hard work,” explains continues Felix Baumgartner. 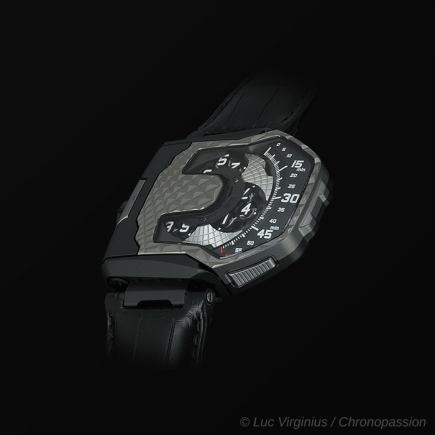 The back shows the turbines of the UR-105 T-Rex which regulate the winding of the watch. They are adjusted by means of a lever. In the “FULL” position, even the slightest movement is leveraged to help wind up the mainspring. 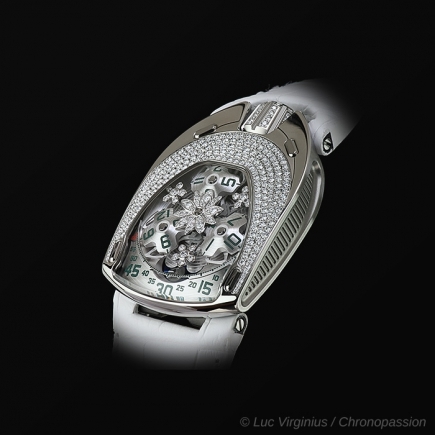 The UR-105 T-Rex is thus in automatic winding mode and its winding is optimized by the effect of its turbines. 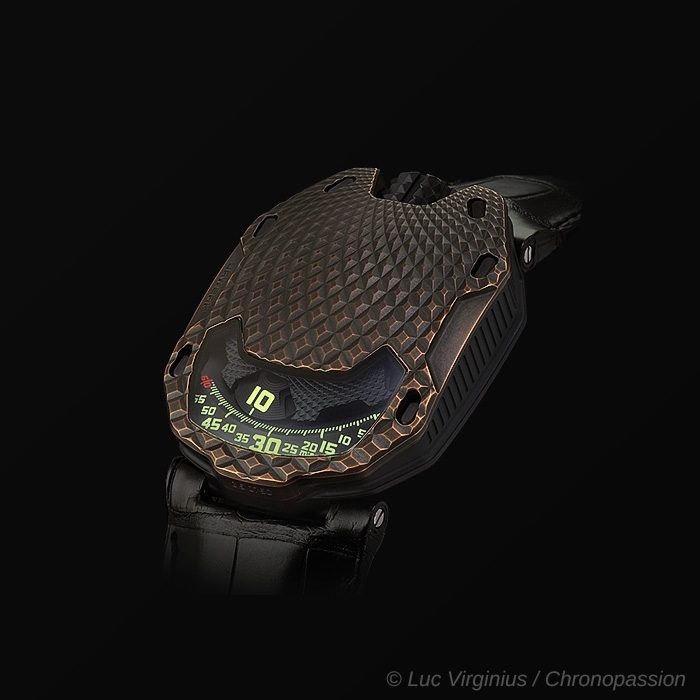 In “STOP” mode, the winding system is disabled and the UR-105 can thus be hand-wound if required via the crown. A third intermediate “RED” (for REDUCED) moderates the winding so as to avoid excessive tension on the mainspring. Carousel and triple mainplates in ARCAP. 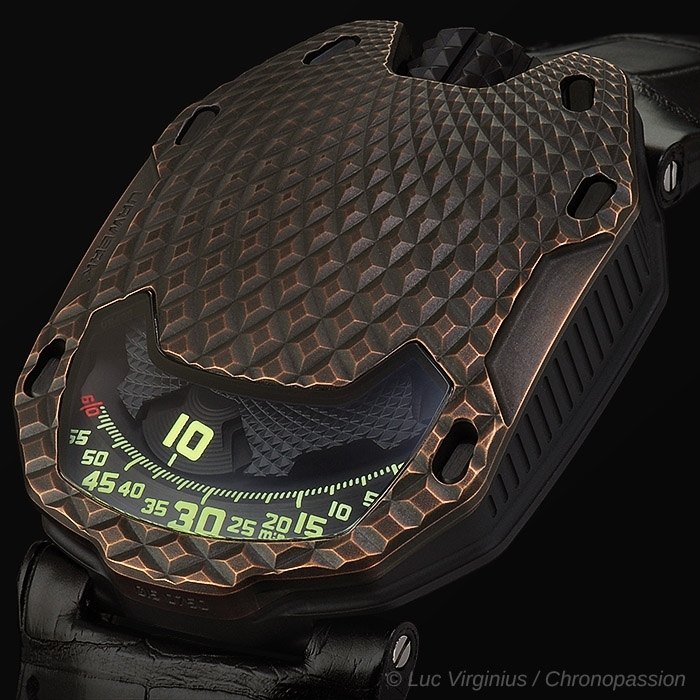 URWERK UR-210 CP "CLOU DE PARIS"